Ever notice all the experts in your life? You don’t have to look very far. It really hit home in the run up to Hurricane Irene. 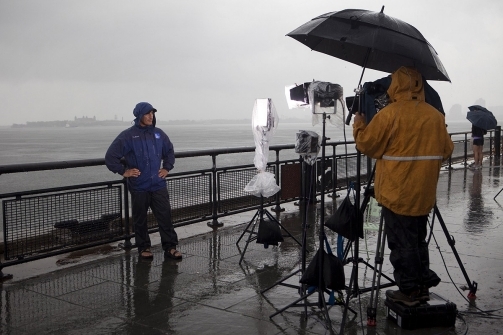 In addition to the TV weathermen standing on every beach on the east coast of the United States being thrashed by wind and rain demonstrating what wind and rain look like, we had our local experts. One of the most authoritative was my gardener who helped me prepare for the storm. Despite the hysterical warnings of The Weather Channel, my gardener was just laying the flower pots on their side near a wall for shelter and tying up the outdoor furniture with rope and pushing it against the house. When I suggested maybe we should put it all inside the house or down in the basement, he said, “No problem. This will be fine. Your house will be rock solid. Even in the Great Hurricane of 1938, this would all have been fine.” Now, our house was only just built last year. And while he may have been alive for the Hurricane of ’38, he would have been an infant. We also had house guests during the days immediately preceding the hurricane. They were from Florida (they just couldn’t bear to miss a hurricane). So they had their views on the likely severity of the storm and assured us that we and our house would be safe. Of course, their house is constructed with steel-reinforced concrete and hurricane glass. Ours is made of wood, shingles and regular glass. Another friend of ours (who makes furniture, cabinetry and kayaks) stopped by, told us that he had been in many hurricanes and assured us we would be fine. Well, we were fine. The experts were right. They always are. Until they’re not. This entry was posted in Humor, Ruminations and tagged experts, Hamptons, Humor, Humour, Hurricane Irene, Irene, Long Island, Musings, Storm, Weather Channel. Bookmark the permalink.